Read the review of Flipkart SmartBuy Wired Metal Headset With Mic - a Flipkart exclusive earphone which is available at a budget price. Know about its bass/treble balance, the noise cancellation ability, build quality and microphone quality by going through my complete review. I am an earphone person. I need my earphones when I am traveling in public transport when I am working alone on my desk writing something and of course when I am watching my favorite movies. Selecting durable headphones which can give a perfect fit, have the right balance of bass, can do noise cancellation and work as microphones too during calls is a challenge no small. Today I have decided to give a try to Flipkart SmartBuy Metal Headset with Mic which is a Flipkart exclusive and has quite rave reviews from people who have used it. At the price of Rs.349, they are quite cheap and I received my order on the second day itself. Since then a week has gone by and I am ready to review this small piece of supposed excellence. 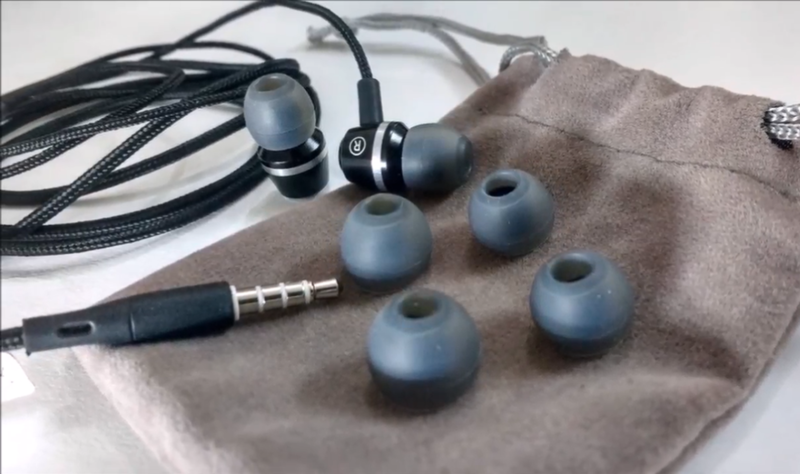 In-Ear Fitting - The earphone is in gunmetal shape and contrary to what I read by some reviewers, the shape fits perfectly in my ear. It does slip easily and kevlar material is sweat repellant so no soggy feeling in your ear. At just 12g it is as light it can get. Noise cancellation microphone - You won't need to pick the microphone part and bring it near to your mouth to be clear on call. Even while traveling in public transport I found that the voice being transmitted was quite clear and loud. However, the mic is located at around 14 inches away from the earphones so it is better to keep the microphones tugged near about the chest level to avoid any noise at all. A clip near the Y joint where the microphone is located would have solved the problem but the same is missing in this headset. Bass/Treble - The ratio of treble is more than bass which is slightly noticeable in rock or hard rock music. This is a small imperfection that is present in the headset but it is not something that everybody is going to notice and at this price range is acceptable. FX Effects - Audio effects associated with music is reproduced with average quality. Distortion and Time-based effects were not exactly reproduced by the earphones whereas in case of Modulation, Pitch and Dynamic effects the reproduction was quite satisfactory. Overall an average rating in this department. Overall I would give this headset a rating of 4 out of 5. It lags in the department of bass-treble balance, the microphone is located at quite a distance from the headset and the clip is also absent which could have resolved this small issue. Other than these 2 issues, the good things are the build quality, the earpiece shape which had a perfect fit for me, noise cancellation is good for this price range and the price range itself is a big attraction for the quality you are getting. Recommended I this is your budget range otherwise there are better options above Rs.500. Ever wondered how students can develop themselves with smart gadgets? If yes, then read our resource which shows the top ten essential gadgets for tech freaky students. The list displays the best gadgets which can be utilized by students during their college or higher secondary grades. The usage, important characteristics and device functionalities has been explained in detail. Shut the world out when you listen to your favourite music through these wonderful headsets in Amazon.in now available below the budget of Rs.5000. Know what makes them featured in our top 5 list. There are lot of headphone models available in the market and it is very difficult to choose one from the lot. Here comes the detailed review of UERM, Ul Ultimate Ears RM headphone, a quality model with many digital qualities. Bass, sound quality, comfort, light weight, blue tooth and an affordable price - if these are the features that you are looking for in a headset, then there is an entire list of products to choose from. Quality comes with a price and the headphones listed here range between 2500+ to under 10,000.